I have pumpkin carving issues. It’s gotten to the point where my family lets me carve the eyes, the nose, and the hole in the top but I’m not allowed to get within a Butterfinger’s length of the mouth. The scary grin is off limits because for the last couple of years I’ve mistakenly cut off the teeth and we’ve ended up with a toothless, geriatric Jack-O-Lantern. It’s not exactly spooky looking unless you’re hoping for a set of dentures in your Halloween candy bag or you have an irrational fear of Bart Simpson’s grandfather. I actually like Halloween but I know some Christians don’t share my attitude — something about it being satanic in nature. I think it’s a lot of fun and not just because free candy is the best kind. Plus how can you say something is evil with so many devilishly cute kids running around with such joy? But beyond the mounds of candy corn and fake spider webs, All Hallow’s Eve has Christian roots and is thus a great teaching opportunity. The day we dress up and trick-or-treat is steeped in the ancient Christian feasts of All Saints’ and All Souls Day. There’s a great tradition of mocking death — hence the ghoulish costumes — as we stand in sure and certain hope of the resurrection of Jesus Christ. On All Saints’ Day (November 1) we remember the great saints of the church who have come before us in the faith and continue to inspire us — those “Big S” saints like St. Francis and St. Mary. On All Souls Day (November 2) we remember those whom we have loved and lost in our own lives — those “small s” saints like Uncle Frank and our sister Mary. So whether you’re dressed up as Miley Cyrus or Ted Cruz, you’re participating in a ritual that transcends the surface plane of life, speaks to something deeper, and reminds us that we are all connected to one another in what Christians call the “communion of saints.” In other words, it’s mostly about our faith in God but the sugar high can’t help but contribute to the joy of the human-divine connection. My boys are at the age where they’re torn between participating in a “childish” ritual and the allure of free candy. Whether they go out trick-or-treating on Halloween will likely be a game time decision based on what their friends are doing. Unfortunately they’re now much too old for me to engage in one of the greatest scams going — trick-or-treating with an infant. I remember my eldest son’s first Halloween – he was four months old. We put him in a homemade strawberry hat someone had given us and I dressed all in white; together we were strawberries and cream. People thought Ben was so cute (they ignored me) they would fill up his bag with candy. Of course, since he was too young to eat it, I was forced to keep it for myself which meant that I was literally stealing candy from a baby. 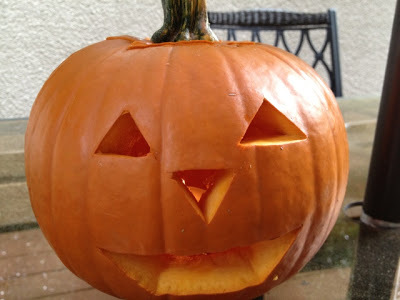 As for me, sometimes after the rush of trick-or-treaters dies down I stand in the doorway with my toothless Jack-O-Lantern burning bright, reflecting on what was behind all those costumes that traipsed up the front steps. If you took away the masks and hoods and dyed green hair you’d find something greatly resembling a saint. I don’t mean that the saints we honor in stained glass ever rubbed soap on car windows or engaged in other ghoulish pranks, but they were all human beings just like you and me. They weren’t super-human, they were simply super humans who put their faith at the very center of their lives. Ted Cruz? That’s one scary dude. Has anyone noticed how his skin looks like a ceramic doll? Thank you for always educating us and writing with such faith and conviction. A blessed All Hallow’s Eve.
. . . not so sure about those Christian roots — I think Halloween or All Hallows’ Eve is Christian by adoption and grace, but heavens: black cats, witches, and chocolate — three of my favorite things! Happy Samhain; blessed All Hallows’ Eve. I sing a song of the Saints of God …. and one was a doctor and one was a queen…..
Oh, satanic shmatanic. I’m 61 and I’ve never outgrown my love of halloween! Some people need to lighten up!